Your Trusted Source for CPAP Equipment & Supplies! CPAP EquipSources mission is to provide CPAP therapy customers with an option to view and purchase. CPAP EquipSource’s mission is to provide CPAP therapy customers to Cleveland OH area clients, with an option to view and purchase the latest masks and machines on the market in a showroom setting at our retail store. We stock all types of CPAP supplies commonly used by patients on therapy. We also carry several types of portable oxygen concentrators and nebulizer machines and the new cleaning machines and small oxygen units seen on television. Not able to visit our store? We take phone orders at 1-833-285-0660, via email: orders@cpap411.com or by fax: 1-866-763-9505. Orders can be paid with a major credit card and are shipped to customers. Many CPAP patients have become tired and frustrated dealing with their current provider due to lack of service or mask and supply options. Insurance companies make it difficult for patients to approve and receive what they need to begin therapy. This results in patients not getting the appropriate equipment and supplies that they desperately need to use their prescribed CPAP machine to get a good night’s sleep and have a better quality of life. Insurers do not want to pay for medical equipment that is not being used. Therefore, most will initially lease the CPAP machine for you. This will allow you an opportunity to demonstrate that the treatment is tolerable and effective. Unfortunately, a lot of people do not overcome initial problems getting used to CPAP therapy. Therefore, many people do not use the therapy long term, even though it can be extremely effective if it is tolerated. After a lease period that typically lasts 13 months, the insurer will have completely paid for the machine and you will own it outright. Usage monitoring helps to ensure adequate compliance. During the first few months, the insurer will want to keep tabs on you to make certain you are one of the patients who can tolerate it. If it sits in your closet gathering dust, this doesn’t help treat your condition and it wastes the insurance company’s money. CPAP devices have a modem or an SD card that collects data on your use through monitoring. This can be used to generate a report that tells how much you use the device. This data is used to dictate payment for the machine. In general, you must use your CPAP at least 4 hours per night, 70 percent of the nights for insurance companies to pay for the device. This criterion is based on Medicare’s standard that, in turn, is based on studies that show at least 4 hours of use are required for the cardiovascular benefit of treatment. This compliance is typically measured over a continuous period of 30 days within the first 3 months that you have the CPAP. In addition, you must check in with your sleep specialist who will assess your response to treatment and ensure you are deriving a benefit. If you are unable to meet that compliance threshold, or it simply is not helping you, the insurer will demand that the machine is returned to the DME provider and will not pay for it. CPAP EquipSource helps solve this problem by giving customers a physical location to come and pick-up the equipment, supplies and cleaning devices needed to continue their therapy. We also take phone orders and can ship anywhere in the USA. Serving northeast Ohio and the greater Cleveland area, our store is stocked with the latest continuous positive airway pressure (CPAP) therapy products, providing you the opportunity to come in and see the products before making a purchase. We carry the top selling CPAP masks and machines on the market, but if you don’t see what you want, we can order it for you! Fortunately, if you are a current Middleburg Heights or greater Cleveland CPAP user and ever find yourself needing supplies such as tubing, filters, cleaning agents, or other accessories, we’ve got you covered! Our store is stocked with parts commonly needed by CPAP users. Customers can now pick up a monitor to test themselves for sleep apnea from the comfort of their beds. CPAP EquipSource offers an array of therapy solutions to help treat and manage sleep apnea. Introducing a faster, easier, more effective way to clean CPAP machine equipment. 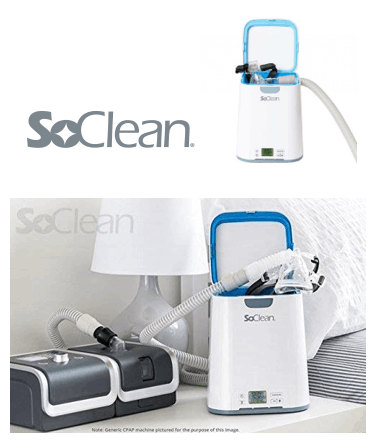 SoClean kills 99.9% of CPAP germs and bacteria in your mask, hose and reservoir with no disassembly, no water, and no chemicals in order to enhance your home CPAP experience. Meeting the CPAP Equipment and Supply Needs of Our Customers with Compassion and Integrity! CPAP EquipSource is a cash only medical distributor and does not accept insurance assignment and is not a participating provider with any insurance companies. Purchasing through us often cheaper than your copay and deductible through insurance or renting a machine. Check with your private insurer to see if they will reimburse you directly for the purchase. Medicare, Medicaid and other government run healthcare programs will not reimburse customers for out of pocket purchases.